Gritty and artistic, but not as exciting or action-packed as it should have been. the problem is not with the talk about the characters are going to do, it’s in how they back it up. do they execute on these threats. in this movie, denzel washington’s character, creasy, does some, but not enough. the action is very limited. he goes after a couple of low level targets, but it’s a long movie and he should have done a lot more. part of the problem with the movie is that it spends way too much time setting the story up. it’s a movie about a little girl getting kidnapped down in mexico city, but the girl doesn’t get kidnapped until about an house into the film. for that first hour, we meet creasy, see that he has got some major issues, and watch as he slowly warms up to the girl. creasy is a depressed alcoholic. he has apparently been through a lot and has marks on his skin to show for it. and something in his past has made him quiet and upset. you can tell that he used to be a lot more fun, back when he became friends with christopher walken and the two of them were probably doing jobs together. all of this is hinted at, but never really delved into. that becomes a problem when so much of the first hour is devoted to it. what made creasy so upset, and made him take up drinking? the movie never even tries to answer these questions. was there one moment or event that shell-shocked him to the point where he never fully recovered. this movie takes the approach that it doesn’t matter. it spends a lot of time showing us the way this character is, and hinting at why, making us curious, but never supplies us with answers. that’s probably because it feels like the less we know, the more curious we are and the more mysterious creasy is. this is all probably true, but without giving us any answers at all, it feels like something is missing. the first hour of the movie is kind of slow. it’s never boring or anything, but it’s like a drama, and like a different kind of movie then the rest of the film. there is absolutely zero action in that first hour, and instead, we watch creasy and the girl (played by dakota fanning), hit it off. we watch as he trains her in swimming and helps her get better at it. and she helps him to open up and start smiling and laughing a little more. and then after the movie has gone on for a while, we get the big kidnap scene. creasy is shot in the chest multiple times and when it’s all over, he finds himself recovering in a hospital. the news is saying that he shot and killed two police officers, but the officers were corrupt and were in on the kidnapping. how else to explain that they were dressed in full uniform, using their authority to help get what they wanted, when it was their day off from work? creasy gets on his feet again pretty quickly and starts going after the people who kidnapped the girl. he gets one guy in a car and tapes the man’s hands to the steering wheel. he then starts cutting the man’s fingers off. another guy he makes stand by the hood of his car, under a tunnel, put a bomb on him, and blows the guy up. and then in still another scene, he takes a bazooka, aims it out a window, and fires on cars that are coming his way. these three scenes are the major action / violence scenes of the movie. there should have been more. what does help the movie along is that there’s a nice twist towards the end of the film about who was involved in the kidnapping. it isn’t such a cool reveal, how creasy finds out or anything, but at least it’s a cool surprise. and creasy uses that information to put some of the final pieces of the puzzle together. 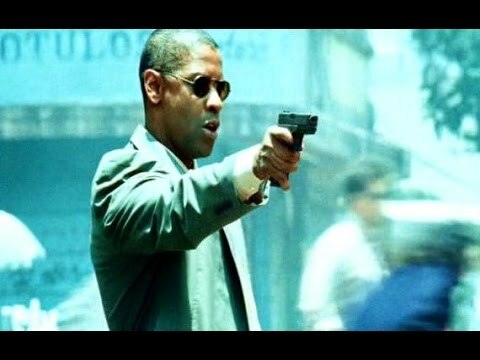 Man On Fire is an okay movie. it’s a tony scott film, and that means bright lights, rapid fire editing, and blurry images. he’s like the wong kar wai of american cinema. just look at wong kar wai’s chungking express and tell me that’s not an asian tony scott at work. scott likes things messy, but artistic. he likes the gritty. unfortunately, he’s not a very good storyteller. his movies end up being all pretty much the same, from true romance to enemy of the state to domino. the man puts style ahead of substance and runs into many problems as a result. 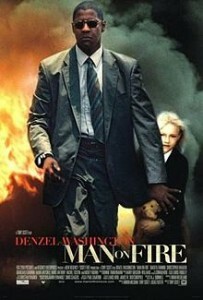 Man On Fire is better than his usual movie, but it’s nothing great. scott was at his best towards his early years, the late eighties and early nineties, making movies like top gun and true romance. but once he discovered technology and rapid fire editing, (right around the time he made the movie spy game), things went downhill for him fast. the main reason Man On Fire works is because of denel washington, and his powerful go for broke performance. washington is tony scott’s go to guy, and this movie shows us why. it’’s a little too slow moving to do everything it sets out too, but it still worthwhile, just for washington’s performance alone.